Toxic metals comprise a group of minerals that have no known function in the body and, in fact, are harmful. Today mankind is exposed to the highest levels of these metals in recorded history. This is due to their industrial use, the unrestricted burning of coal, natural gas and petroleum, and incineration of waste materials worldwide. Toxic metals are now everywhere and affect everyone on planet earth. They have become a major cause of illness, aging and even genetic defects. The study of toxic metals is part of nutrition and toxicology, areas not emphasized in medical schools. For this reason, these important causes of disease are accorded little attention in conventional mainstream medicine. This article focuses on the extent of toxic metal problems – sources of toxic metals, symptoms and how to remove them safely, quickly and deeply. This is not an easy task, I might add. Many methods are used together. Most important, however, is that at the same time we use chelators, antagonists, sulfur amino acids and other methods, we balance the body chemistry very delicately using hair mineral analysis. This is the secret, really, to our success which is great. Minerals are the building blocks of our bodies. They are required for body structure, fluid balance, protein structures and to produce hormones. They are a key for the health of every body system and function. They act as co-factors, catalysts or inhibitors of all enzymes in the body. Copper and iron, for example, along with other minerals are required for the electron transport system, and thus needed for all cellular energy production. The macrominerals, or those needed in large quantity, include calcium, magnesium, sodium, potassium, phosphorus, sulfur, iron, copper and zinc. Required trace minerals include manganese, chromium, selenium, boron, bromine, silicon, iodine, vanadium, lithium, molybdenum, cobalt, germanium and others. Possibly required trace minerals include fluorine, arsenic, rubidium, tin, niobium, strontium, gold, silver and nickel. Toxic metals include beryllium, mercury, lead, cadmium, aluminum, antimony, bismuth, barium, uranium and others. Today mankind is exposed to the highest levels in recorded history of lead, mercury, arsenic, aluminum, copper, nickel, tin, antimony, bromine, bismuth and vanadium. Levels are up to several thousand times higher than in primitive man. In my clinical experience, everyone has excessive amounts of some or all of the toxic metals. “Most organic substances are degradable by natural processes. (However), no metal is degradable…they are here to stay for a long time”. Toxic metals replace nutrient minerals in enzyme binding sites. When this occurs, the metals inhibit, overstimulate or otherwise alter thousands of enzymes. An affected enzyme may operate at 5% of normal activity. This may contribute to many health conditions. Toxic metals may also replace other substances in other tissue structures. These tissues, such as the arteries, joints, bones and muscles, are weakened by the replacement process. Toxic metals may also simply deposit in many sites, causing local irritation and other toxic effects. They may also support development of fungal, bacterial and viral infections that are difficult or impossible to eradicate until this cause is removed. The mineral replacement process often involves the idea of preferred minerals. For example, the body prefers zinc for over 50 critical enzymes. However, if zinc becomes deficient – and our soil and food are very low in zinc today – or exposure to cadmium, lead or mercury is sufficiently high, the body will use these in place of zinc. Cadmium, in particular, is located just below zinc in the periodic table of the elements, so its atomic structure is very similar to that of zinc. It almost fits perfectly in the zinc binding sites of critical enzymes such as RNA transferase, carboxypeptidase, alcohol dehydrogenase and many others or great importance in the body. The ability to replace a vital mineral means, however, that toxic metals are not completely harmful. Indeed, they can extend life. They keep bodies functioning when vital minerals are deficient. An analogy is to imagine taking an automobile journey. If one is far away from a repair shop when a key part like the fan belt breaks, if one had a spare piece of rope, one could tie it around the pulleys and continue the trip slowly. The rope would not function nearly as well as the original part, but would allow one to keep going. This is how toxic metals can function positively in the body. Many people limp along on grossly deficient diets, and are even born deficient and toxic. They do not realize their fatigue and other symptoms are due to the presence of incorrect “replacement parts” in their biological engine compartments. Depending on where toxic metals accumulate, the resulting effects may be given names such as hypothyroidism, diabetes or cancer. 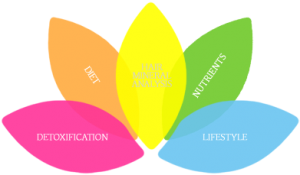 The idea of preferred minerals is discussed in a theoretical context in the article on the Center For development website entitled The Theory of Nutritional Balancing Science. 1. Hybrid crops are bred for production or disease resistance, rather than superior nutrition. 2. Superphosphate fertilizers produce higher yields by stimulating growth, but do not provide all the trace elements. 3. Monoculture, the growing of just one crop over and over on the same piece of land, eventually depletes the soil. 4. Toxic sprays damage soil microorganisms needed to help plants absorb minerals from the soil. 5. Food refining and processing almost always reduce the mineral content of our food. Whole wheat flour, when milled to make white flour, loses 40% of its chromium, 86% of its manganese, 89% of its cobalt, 78% of its zinc and 48% of its molybdenum. Refining cane into sugar causes even greater losses. EDTA may be added to frozen foods to retain their color. However, this chelating agent removes minerals that otherwise would cause the surface minerals to ‘tarnish’, discoloring the vegetables. As a result of the above, according to Dr. Weston Price, DDS, author of Nutrition and Physical Degeneration, primitive man ate 5 to 11 times the amount of the essential minerals in his diet as modern man. The term ’empty calories’ aptly describes most of our food today, even most natural foods. Organically grown is better, but varies and most organic food is still hybridized varieties. Newer genetically modified crops could be better in some ways, but some are worse. For a more complete list of sources for each of the major toxic metals organized by the metal, see the Toxic Metal Reference Guide. Sprays and insecticides still often contain lead, arsenic, mercury and other toxic metals. Refining of food often contaminates the food with aluminum, as it is found in water supplies everywhere. Also, food refining removes the protective zinc, chromium and manganese from food and leaves the toxic metals in some cases, such as cadmium. This makes white flour even more toxic, as with white sugar, and is another reason to totally avoid these foods. Arsenic. Arsenic I call the slow death mineral. Its symptoms are vague, and it was used to kill people because it is colorless and tasteless so it was added to food and slowly killed people. Today arsenic is still a common toxin. It may be added in up to 70% of chickens in their feed asRoxsarone and perhaps in other additives that are still permitted by the idiotic and corrupt FDA and USDA in America. Europe has banned arsenic in chicken feed, but I don’t know if some are still using it. It gets into commercial eggs, all pig products such as pork, ham, bacon and lard, and into most US drinking water supplies as it leaches into the soil from farming and livestock operations. Organic chicken and eggs should be better. Avoid all pig products for other reasons and this one, too. Arsenic is used in pesticides and, as a result, may be found in commercial wines, beers, fruits, vegetables, rice and other foods. Once again, organically grown should be better. Lead is called the horror mineral because it is associated with violence, lowered IQ, ADD, ADHD and many neurological problems. another widely distributed toxic metal due to its many uses in industry. However, mercury, arsenic, cadmium and particularly aluminum are just as widespread if not more, but are less well-studied. Pesticides used on fruits, vegetables and many other foods may contain arsenic, lead, copper, mercury and other toxic metals. Lead was added to gasoline until the 1970s when lead-free gas replaced it. The new gasoline has manganese in it instead of lead. Old house paint, current paint used on ships of all sizes, lubricants, medications, cosmetics such as lipstick and others, inks, and perhaps other products may contain lead. Entire books have been written about lead toxicity, which causes hundreds of symptoms from anemia to death. Cadmium is called the pseudo-macho or the violent element. Like lead, it is an older male mineral that is associated with macho behavior, violence and horror. People who have orgasms more than once a week tend to accumulate cadmium, probably because it replaces zinc in the male testicles and even in women’s ovaries. Male and female sexual fluids are rich in zinc, and when one loses too much of these, cadmium from the environment seems to replace the zinc in the body. Cadmium is widespread in the air, as it is used in brake linings of cars. It is also used in metal plating as it is a very hard substance. Cigarette smoke and marijuana smoking can contribute to cadmium toxicity. Cadmium toughens the tissues and hardens the arteries. Some women have cadmium in them that allows them to function in a male-oriented jobs and positions of authority. Cadmium helps them and others to act more tough and manly. Military and police often have more cadmium, as it helps them handle their very difficult jobs, at times, and take risks. Unfortuately, it is also a deadly toxic metal associated with heart disease, cancers of all kind, kidney disease, diabetes and other health problems. Mercury and others from the sea. Mercury may be called the mad hatters mineral. People who made raccoon skin hats in the mid 1800s in America and Europe developed mercury toxicity after a few years from rubbing mercury on felt to soften it. They became mentally and emotionally deranged in many cases. Fish, especially those caught near the coast or in contaminated streams or lakes, are universally contaminated. Mercury is found today in ALL FISH, bar none. Even small fish, which used to be safe, are not any more. This is sad as fish is otherwise an excellent food. As a result, the only fish I recommend are very small fish, and the best is sardines because of their content of omega-3 fatty acids and vitamin D, along with calcium, selenium, RNA, DNA and many other vital nutrients. The omega-3 fatty acids and vitamin D are almost universally deficient in modern diets and are important for every one. Articles on this website detail this sad nutritional deficiency. Sardines in the can are fine. A can three or four times per week will supply an adult with adequate omega-3 fatty acids, and this is actually better at this time than using supplements of fish oil and vitamin D, although these are fine as well. All other fish should be avoided, except perhaps occasional small fish like sole, smelt, anchovies or herring. Large fish concentrate mercury a million times or more. The federal government recently issued a warning that pregnant and lactating women should avoid tuna, shark, king mackerel and other large fish. I recommend everyone avoid these fish! Avoid shellfish. Shellfish and bottom feeders in particular contain excessive cadmium, mercury and other toxic metals. Please avoid all shellfish, forever, as the problem is just getting worse in most nations of the world. Once again, they are not bad foods if they are processed correctly, but the toxic metal levels are incredible at times. This is why many people are “allergic” to them. This is a mild term. They are really poisoned by them. Aluminum. Aluminum is called the soft in the head mineral because it is associated with memory loss and dementias. All types of salt contain some aluminum. Table salt often has aluminum added as an anti-caking agent and should never be eaten. Sea salt is better but contains some aluminum as well. Beverages in aluminum cans or food cooked in aluminum may contain elevated levels of aluminum. Ceramic plates and cookware from other nations often contain leaded glazes that come off onto the food. Anti-perspirants all contain aluminum compounds. Use an old-fashioned deodorant instead, or put some liquid soap like Dr. Bronner’s peppermint soap under your arms instead. Nickel. This is called the depression and suicide mineral, as it is associated with these feelings and symptoms. It is a particularly deadly toxic metal. It is found in large quantity, sadly, in some older metal or even ceramic dental fixtures such as crowns and some wires used in bridges and braces. Be very careful about this because nickel can contribute to cancer and other horrible problems. If you suspect you have nickel-plated crowns or dental wires of some kind, talk to your dentist about the problem and try to find out the materials in your mouth. One way to save thousands of dollars, though not a perfect solution, would be to coat dental wires and even the sides of crowns with clear nail polish to keep the nickel from rubbing off into the body. DO NOT TRY THIS AT HOME, however. Go to a dental office where they have a suction machine and do it there, or have the hygienist do it for you. Nail polish gives off very toxic fumes and these should never be breathed, ever. Nickel in much smaller quantity in hydrogenated oils found in commercial peanut butter, margarines including soy margarine and vegetable shortening. Cadmium used as catalysts. Toxic drinking water. This is the most important source of toxic metals for most people. Aluminum, copper, toxic chlorides and fluorides are added to many municipal water supplies. Aluminum allows dirt to settle out of the water, while copper kills algae that grows in reservoirs. Chlorine is used to disinfect water, although ozone works very well and is a far more healthful treatment. Wells and even municipal water may also contain some lead, arsenic and other undesirable metals. Galvanized and black plastic pipes can be an important source of cadmium. Lead-soldered pipes and copper pipes may increase these metals in the drinking water if the water is soft. It is an uncommon problem in hard water areas. Fluoride is sometimes called a cancer mineral. Adding fluoride to drinking water not only does not stop cavities in the teeth. It is totally insane, because fluoride compounds added to drinking water are extremely toxic. The entire world has stopped this practice except for parts of America and Great Britain. Fluorides have found their way into ground water supplies, and thus into the food chain. Fluoride levels in foods processed with water may be very high, especially baby foods and reconstituted fruit juices. Health authorities who recommend fluoridating the water are extremely ignorant, in my experience. I have debated dentists and public health officials and their level of knowledge of the medical literature on fluorides is horrendous. They rarely if ever take into account the toxic effect of fluorides already found in natural foods, foods processed with fluoridated water and fluoridated toothpaste. The combination adds up to overload in all cases. Hydrofluosilicic acid, the chemical often used to fluoridate drinking water, is a smokestack waste that contains lead, mercury, cadmium, arsenic, aluminum, benzene and radioactive waste material. Airborne Sources of Toxic Metals. Most toxic metals are effectively absorbed by inhalation. Auto and particularly aircraft exhaust, industrial smoke and products from incinerators are among the airborne sources of toxic metals and other chemicals. Mercury and coal-fired power plants. Burned high in the atmosphere, aircraft fuel deposits everywhere and affects everyone on earth. Burning coal can release mercury, lead and cadmium among other metals. Iranian and Venezuelan oil are high in vanadium. Coal plants should have scrubbers, as they do in the United States. However, they do not in some nations such as China, that are in a great hurry to industrialize and do not realize the damage their plants are causing in the entire world thanks to their pollution of the air, water and food supplies. Other oil is excessive in toxic sulfur compounds. Tetraethyl lead was added to gasoline for many years. Residues are present on pavement and may settle on buildings, cropland and elsewhere. Today, manganese is added to gasoline. Uranium exposure is largely from airborne sources such as nuclear tests and accidental nuclear releases. Incineration can be clean. Older methods of incineration of electronic parts, plastics, treated fabrics, batteries and even diapers release all the toxic metals into the air. The use of scrubbers and newer methods of very high temperature incineration are much better. Cadmium and mercury in papers. Cigarette and marijuana smoke are high in cadmium, found in cigarette paper. Pesticides used on these crops may contain lead, arsenic and other toxic metals. Medications and toxic metals. Many patented prescription and over-the-counter drugs contain toxic metals. Cipro (fluoquinolones) and Prozac (fluoxetine) are fluoride-containing chemicals, for example. “Children are 27 times as likely to develop autism after exposure to three thimerisol-containing vaccines than those who receive thimerisol-free versions”. Direct Skin Contact As A Source Of Toxic Metals. Almost all anti-perspirants and many cosmetics contain aluminum. Dental amalgams contain mercury, copper and other metals. Dental bridges and other appliances often contain nickel. Prostheses and pins used to hold bones together may contain nickel and other toxic metals, although most are titanium, which is much better. Copper intra-uterine devices, if left in place for years, release a tremendous amount of copper into the body. Soaps, body lotions and creams often contain toxic compounds. A few hair dyes and commercial high-end lipsticks contain lead. Selsun Blue shampoo contains selenium that is quite toxic in high doses. Occupational exposure to toxic metals is important for many occupations today. Among the worst are plumbers, electricians, auto mechanics, printers, ironworkers, office workers, other building trades and many other occupations. Workers need to wear gloves, masks and take other precautions when handling inks, metals and other toxic materials. Unfortunately, most occupational exposure occurs without the knowledge of either the worker or the employer today. Congenital Toxic Metals – An Extremely Important And Preventable Tragedy. This is a vital topic that deserves a separate article, so important is it. Here I will just briefly introduce the subject. Today, all children are born with some toxic metals acquired in utero. All the toxic metals pass through the placenta from mother to child. This is seen clearly when reviewing mineral analyses of infants. These are babies who have never been exposed to food, yet their bodies are high in many toxic metals. The only explanation is that these infants receive exposures in utero during gestation. This is a very sad situation, as these children are born with two strikes against them, so to speak. They are far more prone to autism, ADD, ADHD, infections, developmental delays and more. For more information about this critical topic, see the articles on the center for developments website about children’s health. This tragedy can be prevented if all young women would go on a nutritional balancing program before they become pregnant to reduce their load of toxic metals. It would take a year or so to do this, and I am always pleased when young women want to improve their health before becoming pregnant. This topic and horror of current pre-natal care are discussed in a separate article entitled Nutritional Balancing in Obstetric Practice. Toxic metals are not always easy to detect. They lodge deep within tissues and organs. The most common methods of detection include hair, urine, blood, feces and liver biopsy tests. Blood tests are only helpful for an acute exposure, such as eating a food contaminated with lead and doing a test soon after. The problem is that toxic metals are removed quickly from the blood and stored in the tissues where they do less damage. So blood tests must be done soon after an exposure, usually within days or weeks at the most, or they are practically useless. Urine and feces challenge tests. These are used widely by holistic physicians, but they are very poor tests. These are done by first administering a chelation drug that binds to and removes toxic metals. Examples are EDTA, DMPS or another. Then one collects a 24-hour urine or a feces sample to see what comes out of the body. This test is poor and will miss most toxic metals. The reason is that none of the chelating drugs can remove deeply hidden toxic metals. Most chelating agents only circulate in the blood, so they miss most of one’s toxic metals that are bound to the tissues or incorporated into enzymes in the brain, heart, liver and elsewhere. Electrical machines. Electroacupuncture devices, radionic machines and others can detect toxic metals. However, I have not found them too reliable. They are somewhat dependent upon the skill of the operator, which also decreases their reliability and accuracy. Applied kinesiology. This method, also called muscle testing, is also variable in its reliability and extremely dependent upon the operator or practitioner. For these reasons, it is not very accurate and not easy to quantify the metals. Liver or other biopsies. This definitely is more accurate and is used, at times, to detect iron poisoning and copper poisoning, for example. However, liver biopsies are costly, invasive and somewhat dangerous. For this reason, liver biopsies are not used often. This type of biopsy is not invasive, dangerous or costly. The section below gives the protocol I use for interpreting the hair mineral biopsy test for toxic metals. Toxic metals can contribute to any imaginable illness. For example, lead that replaces calcium in the bones can contribute to weakened bones and osteoporosis. Cadmium that replaces zinc in the arteries causes inflammation and hardening of the arteries. Iron that replaces zinc and other minerals in the pancreas, adrenals and elsewhere can contribute to impaired blood sugar tolerance and diabetes. Copper that replaces zinc in the brain is associated with migraine headaches, premenstrual syndrome, depression, anxiety, panic attacks and much more. Mercury and copper that replace selenium in various tissues impairs the conversion of T4 to T3, contributing to thyroid imbalances. Toxic metal accumulation also feeds on itself. As one’s energy production decreases with age, the body is less able to eliminate toxic metals, causing more metal accumulation. Toxic Metals and Gene Expression. Genetic birth defects may be caused by faulty DNA or by faulty gene expression. Even if one’s DNA is perfect, the synthesis of proteins from that DNA can be faulty. For example, zinc is required for a key enzyme in gene expression, RNA transferase. Not surprisingly, zinc deficiency is associated with conditions such as neural tube defects. A recent article in the American Journal of Clinical Nutrition discussed this hidden cause of genetic defects. “An alternate form of a gene present in greater than 1% of the population is called a polymorphism”. 1. Schroeder, H., Trace elements and Man, The Devin-Adair Company, CT, 1975. 3. Braunwald, E. et al, editors, Harrison’s Principles of Internal Medicine, McGraw-Hill, Professional, 15th edition, 2001. 4. Pfeiffer, C., Zinc and Other Micronutrients, Keats Publishing, CT, 1978. 5. Kutsky, R., Handbook of Vitamins, Minerals and Hormones, 2nd edition, Van Nostrand Reinhold Company, NY, 1981. 6. Ibid., Schroeder, H., Trace Elements and Man. 7. Hall, R.H., Food For Naught, The Decline in Nutrition, Vintage Books, NY, 1974. 8. Anderson, M. and Jensen, B. Empty Harvest; Understanding the Link Between Our Food, Our Immunity and Our Planet, Avery Penguin Putnam, 1993. 9. Price, W., Nutrition and Physical Degeneration, Price-Pottenger Nutrition Foundation, CA, 1949. 10. Stannard, J., Shim, Y.S., Kritsineli, M., Labropoulo, P.,Tsamtsouris, A., Fluoride levels and fluoride contamination of fruit juices, J Clin Ped Dentistry, 1991;16(1). 11. From the warning label on hydrofluosilicic acid, Cargill Corporation, FL. 12. Casdorph, H.R. and Walker, M., Toxic Metal Syndrome, Avery Publishing, NY, 1995. 13. National Autism Association, Press Release, Feb. 9, 2004. 14. Eck, P. and Wilson, L., Toxic Metals in Human Health and Disease, Eck Institute of Applied Nutrition and Bioenergetics, Ltd., AZ, 1989, p. xiv. 15. Shamberger, R.J., Validity of hair mineral testing, Bio Trace Element Res, 2002, 87:1-28. 16. Muir, M., Current controversies in the diagnosis and treatment of heavy metal toxicity, Alternative and Comp Ther., June 1997:170-178. 17. Environmental Protection Agency, Research and Development, Toxic Trace Metals in Human and Mammalian Hair, EPA-600, 4.79-049, August 1979, p. 3. 18. Tuthill, R., Hair lead levels related to children’s classroom attention-deficit behavior, Arch Env Health, 1996, 51(3)214-220. 19. Ames, BN, Elson-Schwab, I., Silver, EA, High-dose vitamin therapy stimulates variant enzymes with decreased coenzyme binding affinity: relevance to genetic disease and polymorphisms, Am J Clin Nut. April 2002;75(4):616-658. 21. Mortensen, M.E. and Watson, P., Chelation therapy for childhood lead poisoning: The changing scene in the 1990s, Clin Ped., 1993;32:284-291. 21. Committee on Drugs, American Academy of Pediatrics Treatment guidelines for lead exposure in children, Pediatrics, 1995, 96:155-159.